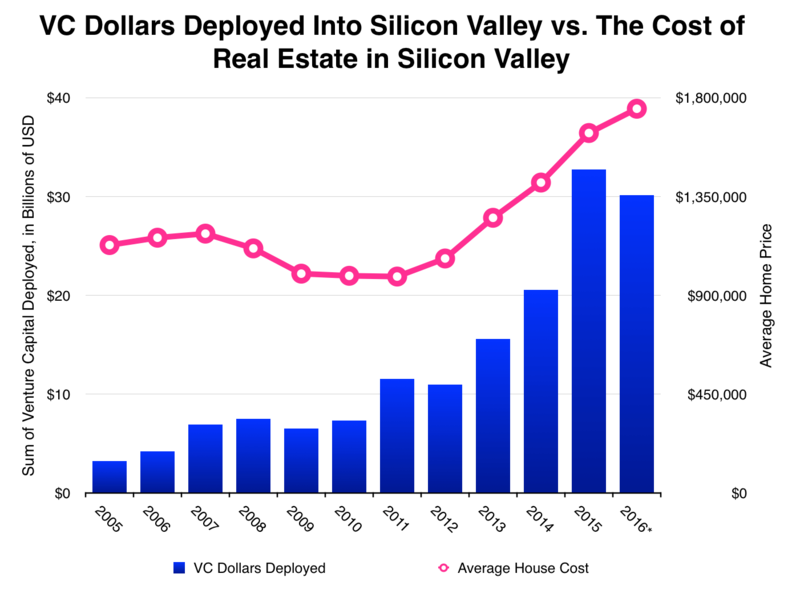 Just How Correlated Are Silicon Valley Housing Prices And Venture Activity? tl;dr: Capital deployed into Silicon Valley-based companies is correlated to housing prices. Additionally, deal volume may predict peaks and troughs a few years in advance. It’s no secret that Silicon Valley real estate is some of the most expensive in the world. With some one-bedroom condos on the market for over a million dollars, it’s easy to think things are a little out of hand. Who’s to blame? It’s easy to pick on Apple and other mega-corporations, but they’re low-hanging fruit. Is it the gentrifying hipsters? Maybe. Hoodie-clad “hackers”? Warmer. Is it the VCs who fund them? That’s a crazy enough idea that it might be right. Last year, Mattermark discovered that the price of high-end housing in Silicon Valley is correlated with the amount of venture capital deployed nationwide. We’re taking another crack at the topic, this time with a more focused dataset. As you likely expected, there is a positive correlation between the amounts of cash VCs are flinging at tech startups and the price of housing in Silicon Valley. And, despite a couple of years that don’t line up with this correlative trend, it’s still remarkably consistent. But that’s dollars. Does the number of deals struck, the volume of deals, show us anything? 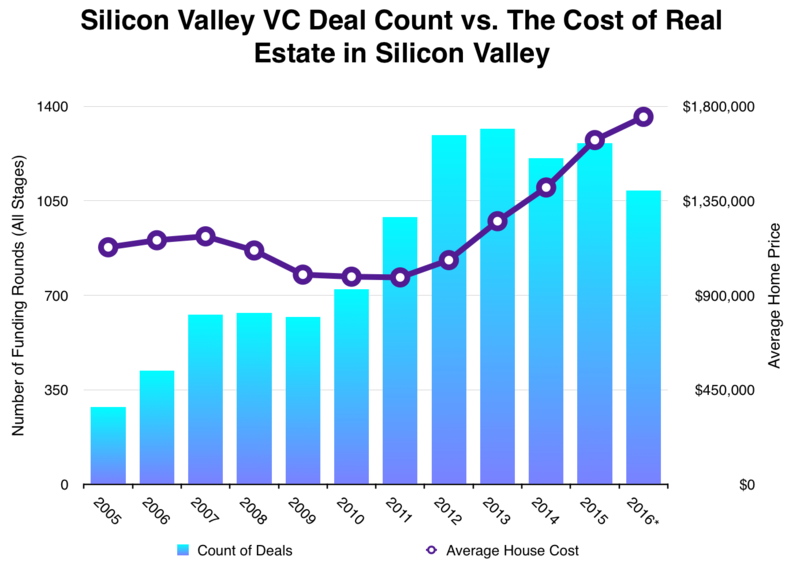 In a region dominated by the technology industry and the investors who seek to profit from it, we found that the number of VC deals may be a leading indicator for housing prices in Silicon Valley. In other words, activity in the VC market might portend how the housing market behaves going forward. However, it’s clear that VC activity and the housing market are correlated. But identifying the mechanism by which one influences the other could be tricky. 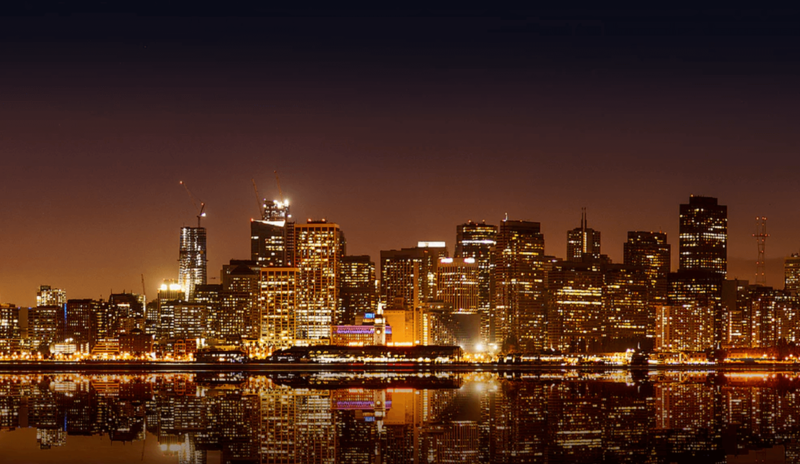 VC Weighs on Silicon Valley’s Housing Market, But To What Extent? Again, our analysis suggests a positive correlation between venture capital activity and housing prices, at least in Silicon Valley. The next question, of course, is why. We do not mean to suggest that venture capital investment is the sole (or even primary) driver of housing prices in Silicon Valley. Like all markets, housing is governed by the laws of supply and demand. For various political reasons, the supply of housing in Silicon Valley is constrained. This has been exacerbated by several local ballot measures passed in last week’s election, such as ones passed by Gilroy, Morgan Hills, and Milpitas, all of which were mentioned in recent coverage by The New York Times. Additionally, fierce competition for talent means that salaries, especially for technical folks, will continue to grow. The combination of more people with more money trying to find a place to live in a region with limited housing stock is a perfect storm for the housing market in Silicon Valley. San Jose has taken the rare step of publicly opposing the project. According to the Wall Street Journal, the mayor’s office implied “it would add far too many jobs, exacerbating the region’s housing shortage.” It’s a problem encountered by many other cities in the region, which is one more reason why Silicon Valley, economically speaking, is a bizarre parallel universe when compared to the rest of the country. It could be argued that venture investment is just another driver of demand for housing, or is a factor that contributes to the aforementioned competition for talent, which would explain the year-by-year correlation of venture dollar volume to housing prices. But that doesn’t explain why an increase in the number of deals appears to foreshadow an increase in housing prices several years in advance. In other words, VC deal volume may be a leading indicator of one of the most significant macroeconomic trends: the housing market. Why deal volume may be a harbinger for the housing market in Silicon Valley is unknown, but if it is, it could foretell a downward trend in Silicon Valley housing prices in the coming years. The volume of deals made with Silicon Valley-based companies peaked in 2013, and if our projection holds for 2016, dollar volume this year will be less than it was in 2015. Since the correlation appears to be with dollar volume rather than deal volume, declines in new financial commitments by venture capitalists and other private investors may lead to declines in the median price of real estate in one of the nation’s most expensive markets. Or alternately, this “deal volume as leading indicator” theory could just be a bunch of balderdash and housing prices will continue to rise unabated. Other market forces may exert more influence than the money VCs and their compadres invest in private tech companies. Regardless, this analysis backs up Mattermark’s findings from last year. Private investment activity does appear to be positively correlated to housing prices in San Francisco, San Jose, and the rest of Silicon Valley. Whether this correlation holds into the future is to be determined. We analyzed over ten thousand private funding events from January 1, 2005 to the end of September 2016—aggregating the deal data for each year. These private funding events were pulled from 29 towns and cities where most startup and venture capital activity is concentrated.1 For 2016, we made a projection for what twelve months of VC deal activity would look like based on the number of deals struck, and the amount of money invested over the first nine months of the year. We then paired this funding data from Mattermark with real estate price data from Zillow, specifically the “ZHVI All Homes” dataset, which tracks the median price of single-family residences, condominiums, and co-ops in a city on a monthly basis. It also adjusts for seasonal variations and other factors.2 Then we took an unweighted average of all the home prices in the 29 municipalities we previously mentioned and aggregated it all by year. In alphabetical order: Atherton, Belmont, Burlingame, Campbell, Cupertino, East Palo Alto, Fremont, Los Altos, Los Altos Hills, Los Gatos, Menlo Park, Millbrae, Milpitas, Monte Sereno, Mountain View, Oakland, Palo Alto, Redwood City, San Bruno, San Carlos, San Francisco, San Jose, San Mateo, San Ramon, South San Francisco, Stanford, Sunnyvale, Union City, and Woodside. For a more in-depth discussion of the methodology behind the Zillow Home Value Index, check out their webpage.